What Was That Stone Arch Halfway Up Lookout Mountain? As a child in the early- to mid-70s the majority of our summer vacations were to Tennessee - a stop in Chattanooga then on to Gatlinburg. We always visited the Incline, Ruby Falls and Rock City. On the way up Lookout Mountain, I’m not sure of the road, there was a stone/cement type monument along the roadway with what looked to be a tongue sticking out the middle. We always called it “the tongue” and it was a fun point of the trip up as we’d laugh about it. I don’t remember ever stopping there as I don’t think there was even a place to pull over where it was. It was kind of nestled into the side of the mountain ground along the road. I also don’t remember there being any inscription on this thing. 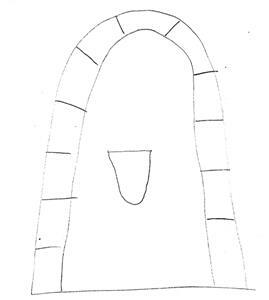 It was shaped like an arch with the stone type bricks around it, maybe six feet in height. 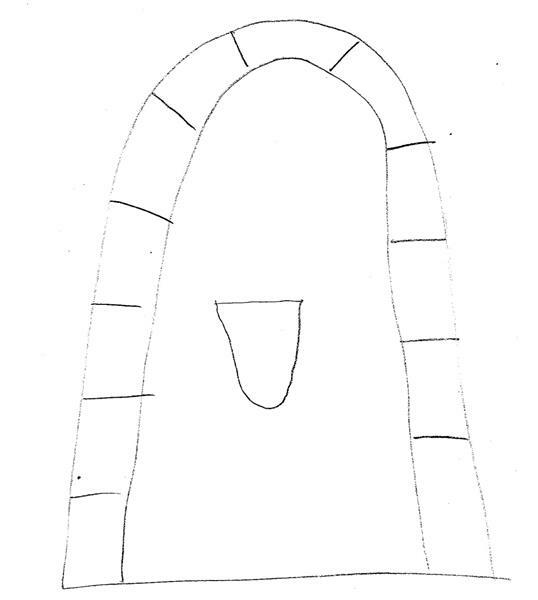 The inside of the arch was cemented in and there was this tongue looking protrusion sticking out the middle. I visited Tennessee again in the early 2000s with my son and looked for it, but didn’t see it. I asked people who worked at any of these attractions and no one knew what I was talking about. I do have it on a VHS tape as we transferred all the 8mm tapes to that. I do plan on transferring that to a DVD. But for now I don’t have my hands on any photos of it, but I am absolutely certain it did exist. I’ve attached a drawing of what it looked like. Please excuse this as I am in no way “artsy!” It was very plain. This has been an interest of mine for a while and I can’t find a thing on it by “googling” it. Would you have any idea what I’m talking about? Janelle, you are referring to a stone arch that was on the right side of the road going up the Scenic Highway not far above the Sanders Road. It is just up from the Winterview condos. This was at the location of a spring that furnished water for many decades to weary travelers going up Lookout. This was at first by horse, wagon or foot. Around the 1920s, members of the Lynde family had the idea to make the spring much more attractive and functional. They built the stone arch. The tongue was where the water came out. Francis Lynde was a novelist who lived not far away just below Cravens House. He taught himself how to cut the mountain stone that was readily available. With the help of his sons, he built a handsome stone house on Carolina Street. The family lived in a frame house that was at the site while the stone walls slowly went up. Unfortunately, the stone arch was demolished when there was a rock slide in the early 1990s.